Win Trumbo: Bryan Cranston's Hollywood blacklist biopic | SWITCH. In 1947, the successful career of prolific screenwriter Dalton Trumbo (Bryan Cranston, in an Academy Award-nominated performance) comes to a crushing end when he and other Hollywood figures are blacklisted for their political beliefs. 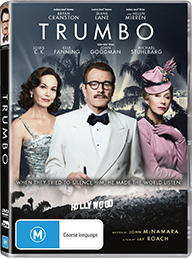 Trumbo tells the story of his fight against the U.S. government and studio bosses in a war over words and freedom, which entangled everyone in Hollywood from Hedda Hopper (Helen Mirren, 'The Woman in Gold') and John Wayne to Kirk Douglas and Otto Preminger. With an all-star cast that also includes Diane Lane, John Goodman, Louis C.K. and Elle Fanning, 'Trumbo' is a witty, spirited leap back to the Golden Age of Hollywood, and an insight into the man behind some of the era’s most beloved films. The 'Trumbo' competition has now closed. Winners will be announced shortly. Competition opens at 5pm AEST on Sunday 12th June 2016 and closes at 11:59pm AEST on Sunday 19th June 2016. Five winners will be chosen at random on Monday 20th June 2016. To successfully win, entrants must fulfil the above entry conditions before the time the competition closes. Current members/followers are eligible to enter the competition. Only one entry per person. Only one winner per household. To be a valid winner, the entrant must not have won a prize from SWITCH within the last 28 days. Each winner will receive one DVD copy of 'Trumbo'. By entering, you agree to receive occasional emails from SWITCH in the future. If you decide to unsubscribe from these updates, any further entries will not be applicable. Only Australian residents are eligible to enter. 'Trumbo' is available on Digital and DVD on Thursday the 16th June 2016 from eOne.